Accelerated Mobile Pages (AMP) is a hot topic at the moment, appearing on news and social media feeds frequently. 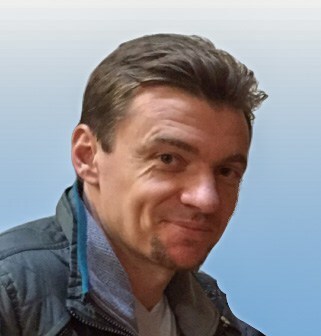 As with every new Google directive, there's always a period where website owners are figuring out whether they should invest time and effort into learning about the new technology. 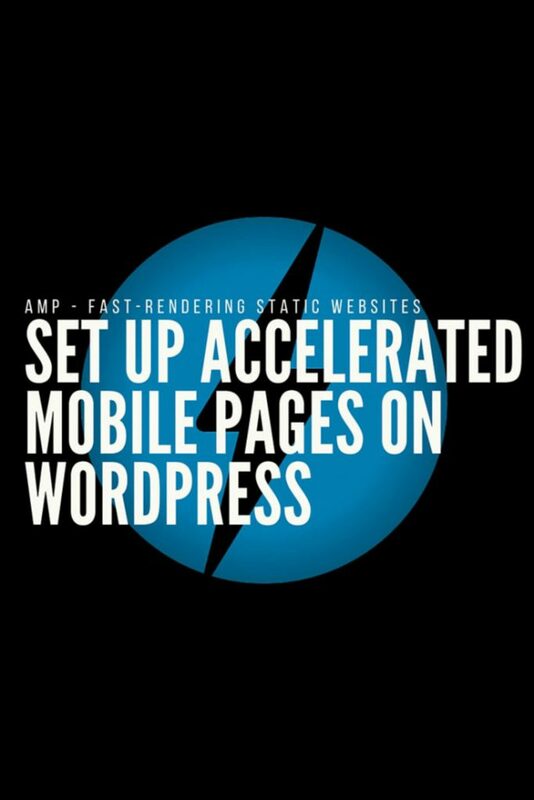 Here I'll explain why AMP should definitely not be ignored and why, if you run a WordPress site, you can easily integrate it into your pages and implement WordPress Accelerated Mobile Pages. It looks like AMP is here to stay and if you want to boost your search engine rankings there's no better way than to play along with Google. Although it's not currently a ranking factor it is definitely worth preparing your site for possible changes to that stance. Accelerate Mobile Pages (AMP) is a specification which provides for very fast loading mobile-optimised web pages. According to Google, AMP is open source and “aims to dramatically improve the performance of the mobile web”. The wow-factor of the technology is that content appears instantly on mobile devices. Twitter and Pinterest are another two large players that are integrating AMP into their products. AMP focusses on content rather than fancy graphics and distracting website features so it's generally aimed at content heavy publisher sites. News sites, blogs, and magazines would be the main target audience. The key to AMP is speed. It’s designed to be fast and lightweight. Ideal for mobile. AMP is also a way around ad-blocking software as ads will be incorporated into the AMP-enabled pages more easily. The future is mobile. Facebook created Instant articles and this is Google’s offering to the open source community. It's still early days but it's a mistake to ignore it. If you have a website and you care about your ranking then you should care about AMP, or at least find an implementation. From a user point of view, there are many benefits. Imagine you’re overseas on a slow but expensive data plan. AMP will save you a fortune as pages load very quickly and use fewer resources. 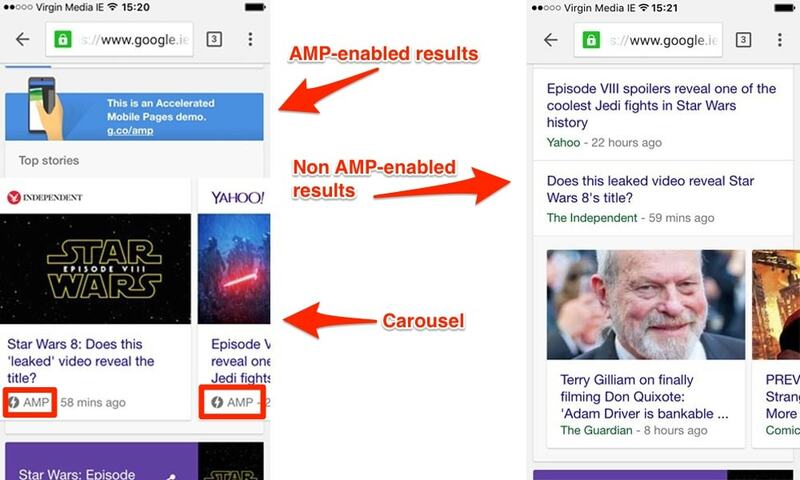 From an SEO point of view, Google will eventually include AMP in their ranking factors. Bounce rate should, in theory, decrease as a result of faster loading pages. This, as we know, is good for SEO. And most importantly, according to MOZ, AMP-enabled pages will appear higher in SERPs. Where can I see AMP in action? Go to g.co/ampdemo (on a mobile device) and you’ll see a regular looking Google search. The results, however, will offer AMP-enabled pages. If there are no AMP enabled results then nothing will appear in the carousel. Most importantly for readers of this site, Automattic, the makers of WordPress. So if you’re a WordPress user (and you most likely are if you’re reading this) you will be happy to know that your favourite CMS is embracing AMP. Automattic has released a plugin for WordPress so yet again WP users are saved from the tedious rewriting of their website's code to implement a new technology. By some accounts, it’s not a perfect implementation but as the technology is still evolving it’s good enough for now. One thing to note is that the AMP pages will not automatically be displayed to mobile users if users arrive at the non-AMP page. There's no redirect facility. The intended path to the AMP-enabled page is through Google's search which understands that your viewing on a mobile device and presents you the AMP-enabled page in the search results. Well as mobile devices and internet speeds get faster there’s always the possibility that AMP will run its course, and it’s main selling point, speed will no longer be such an important factor. Install and enable the WordPress plugin for AMP as you would any other WordPress plugin. Test in Chrome and on your mobile devices by putting /amp after your post title URL. To test whether the page is fully validated as by AMP add this code #development=1 after the URL and then open Chrome developer tools (CMD + Option + I on Mac, F12 on Windows). Click to view the Console tab and you should see a status message similar to the one below. I'm a big fan of Yoast's SEO plugin. As all of my business and client WordPress sites use Yoast for SEO work I'll explain here how to ensure that your AMP-enabled pages are primed for SEO using Yoast. 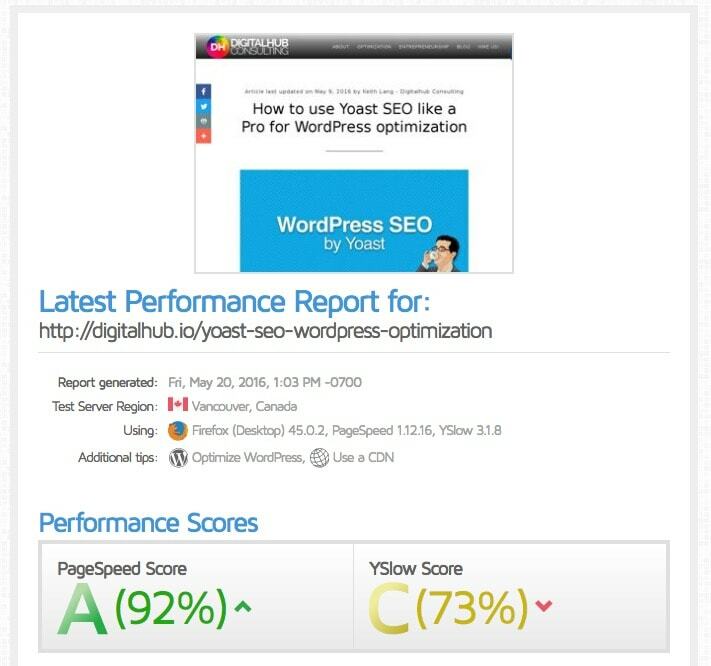 Yoast has released a plugin which, it claims, glues Yoast SEO and AMP together. This plugin, called Glue for Yoast SEO & AMP essentially allows Yoast to provide optimal Metadata to the AMP plugin. The makers of Yoast say they will eventually incorporate this feature into the main plugin so install it if you plan to make the most of SEO for AMP-enabled WordPress posts. 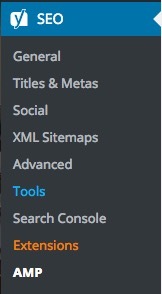 Once installed, Glue adds a new link to the Yoast Plugin menu options. You can easily add a default image for AMP-enabled pages that don’t have a featured image set. Specifying the header color, title color, text color and some other useful settings are also available. The first option near the top of the page is for setting the AMP icon in the page's menu bar. 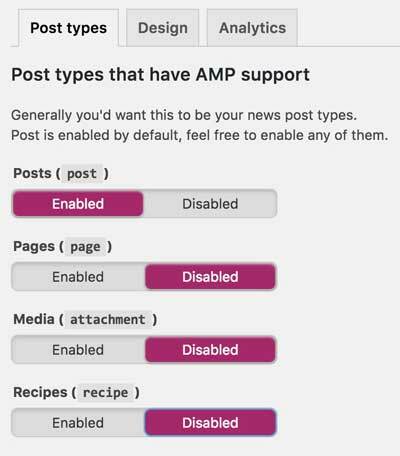 Make sure you select the post types that should have AMP support in the Post Types tab. If you want, for example, Pages, Product Pages, and Recipes served as AMP pages select Enabled on each and save changes. The final step is to test the speed of the AMP-enabled page vs the original page. 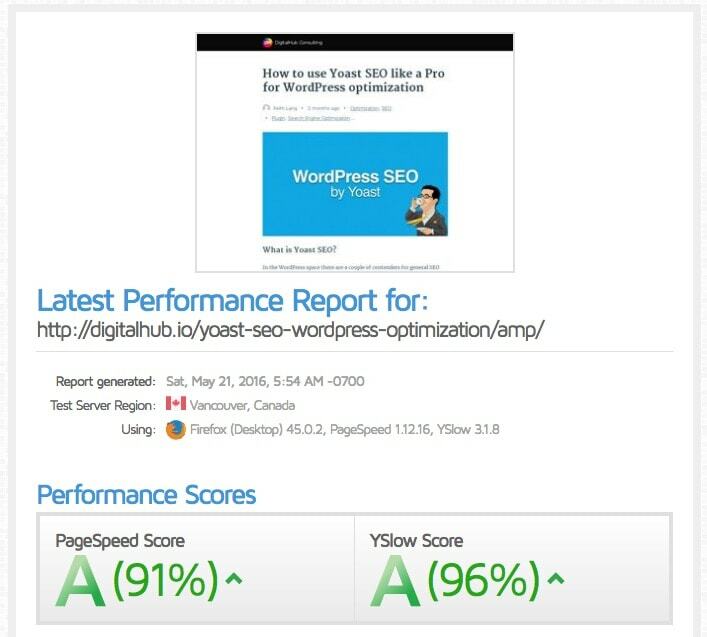 I use my favourite tool GTMetrix to test the speed of a regular page on a WordPress site. There's a significant speed increase, even on an already fast web page. AMP is not for everyone. Multimedia sites, pages that depend on very visual graphics, interactive sites, and quite a few other types of online businesses will not benefit from AMP at this stage. AMP is primarily an option for publishers. WordPress websites are ideally placed to benefit from AMP.